Today is the last day to enter my shop's grand opening giveaway! You have until 12 midnight tonight (that's 12 midnight pacific standard time) to enter. I'll be randomly picking a winner on Saturday and will post who the winner is either on Saturday or Sunday. I'll be contacting the winner sometime that day too. To officially enter, go to this post here and leave me your name, email, and a comment telling me which item in my shop is your favourite. Easy peasy, right? You can also score an extra entry by becoming a follower of my blog and then leaving me a separate comment saying that you're now following me. Don't fret if you're already a follower, cause you can leave me a separate comment too and tell me that you've been following all this time! Sweet, right? Oh yeah, and for those of you who have purchased an item from my shop? You can leave yet another comment telling me what you got for an additional entry. Boo yeah! Entries galore!! Some deets: the fabric is a decor- weight Japanese import (Etsuko Furuya, my absolutely favourite Japanese textile designer) that is made up of a linen/cotton blend. The bag is fully interfaced and completely lined in a beautiful chocolate brown quilting quality 100% cotton, and has a matching brown zipper, interior finishings, and nylon web pull-tab at the end of the zipper. 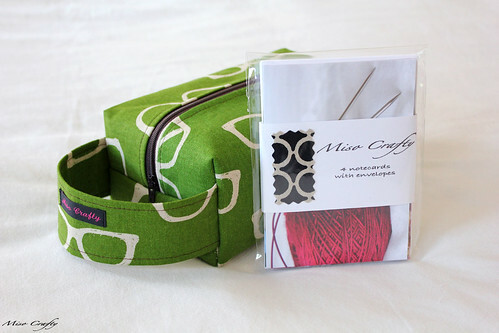 This is my small sized project bag that is perfect for socks, shawls, baby, and other small projects. 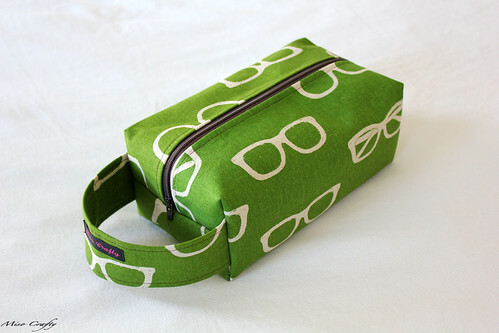 This bag would also be absolutely perfect for toting around the makings for hexipuffs too! I store the beginnings of sweaters and cardigans in mine, and sometimes I can get away with using a small bag for the entirety of a cardigan. So again, enter here for your chance to win! Congrats on your shop opening! I know you've been working on this for a long time. Super stoked I can now stalk you and your goodies online, too! Woohoo!